In the middle of her family’s move to the suburbs, a sullen 10-year-old girl wanders into a world ruled by gods, witches, and monsters; where humans are changed into beasts. I know the people who’ve been with me a while will know that I’ve become a pretty big Studio Ghibli fan in the couple of years that I’ve run this blog. Back in January, I started reviewing as many of these films as I could (you can find the links to all the reviews HERE) but they didn’t get a lot of attention & I wondered if Studio Ghibli was as popular amongst movie bloggers as I’d thought. So when I asked in this poll HERE which movies I should review next of all the ones I watched but never got around to, I was surprised that Spirited Away & Grave Of The Fireflies were the two winners by quite a lot of votes. I know it’s weird that I’ve put off reviewing two of Ghibli’s biggest films but I wasn’t sure what to say about either of them. Fireflies because, well… what can be said about that? 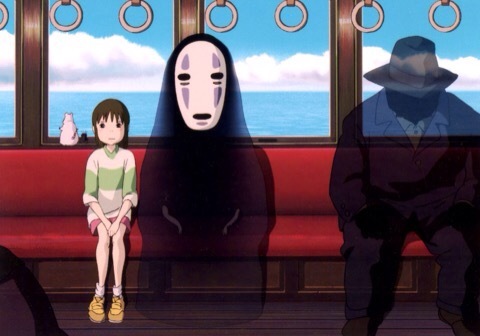 😦 And Spirited Away because I KNOW it’s the favorite Ghibli for a lot of people (and the most highly regarded – it won an Oscar for best animated film & is the highest rated Ghibli in the IMDB Top 250 at number 34 currently) but it’s just never quite connected with me in the same way the other films have. Spirited Away was actually the very first Ghibli I saw back in 2001 (I think – whenever it was first shown in UK cinemas). I don’t recommend it as your introduction to Studio Ghibli as it’s far more “out there” than most the others. Unless you like “weird”… However, I do recommend it if you’re already a fan of the studio and I can see now why it’s so popular even if it’s not my very favorite. I finally re-watched this again in January to see if my opinion would be different all these years later & I can say that I definitely appreciated it a lot more now that I’ve seen so many other Ghibli films. 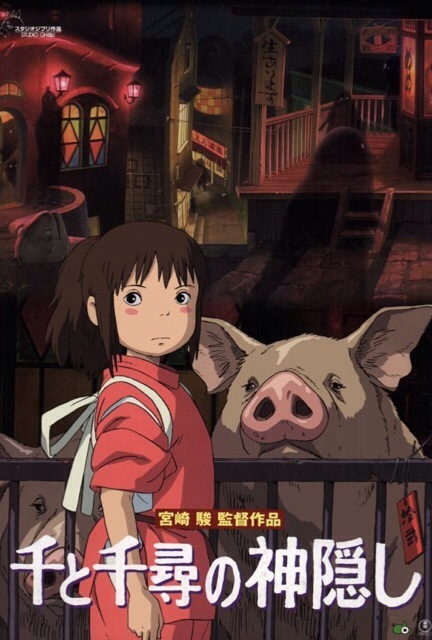 It’s basically just a coming of age story (Ghibli style – with pigs, witches, Susuwatari soot sprites like in My Neighbor Totoro, dragons, and really large babies) & has a good, strong lead female as is often the case with these movies. I think it may be so popular as it’s from 2001 so a lot of you younger bloggers will have been just the right sort of age for it when it came out (I’m guessing it’s a popular one with those who were preteen girls at the time especially). You’ll either absolutely love this one for its weirdness or you’ll be turned off if that’s not your type of thing but it’s certainly another Miyazaki masterpiece and I want to love it as much as I do Totoro or Nausicaä Of The Valley Of The Wind… I really did try to on the re-watch! 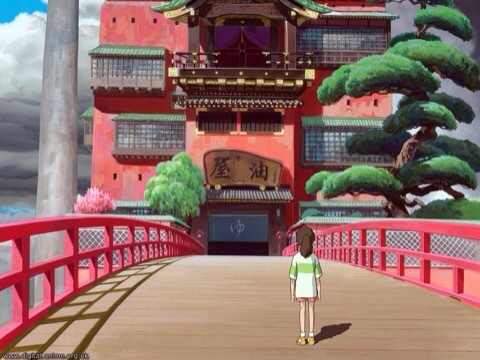 Spirited Away is sort of a Japanese Alice In Wonderland. 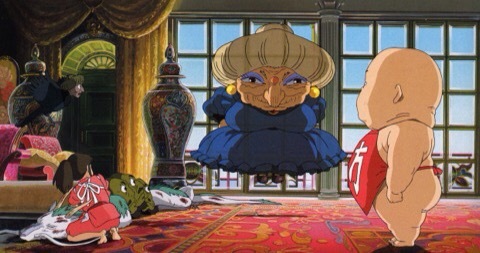 If you like that, you may also appreciate Spirited Away. It certainly has the magical quality & beauty that most the Ghibli films possess (more so, really – it may be the second biggest feast for your eyes after Howl’s Moving Castle). I do think I made a mistake putting it below Howl’s Moving Castle in my Top Ten – Howl’s is very pretty but the story is overcomplicated while Spirited Away has a much stronger and more straightforward story & themes. 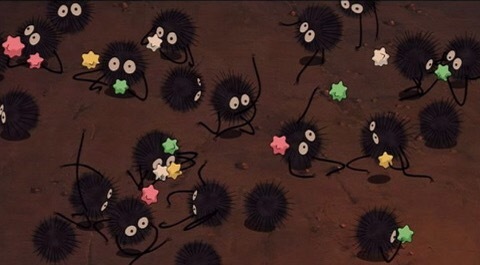 With most Ghibli films, there’s usually a small character that I really latch onto. With Princess Mononoke, it was the Kodama. With Castle In The Sky, it was the Laputan robots. With My Neighbor Totoro, it was of course Totoro. 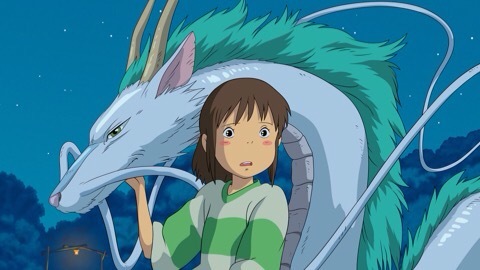 While Spirited Away has very rich characters, I didn’t end up loving any of the lesser characters. No-Face was pretty cool, I suppose, but oh so strange. The girl (Chihiro), as I said, is another great female Ghibli character which is a huge part of the reason why I’m such a big fan of the Ghibli films. This is another movie I want my kid to see someday BUT I myself wouldn’t recommend it to those under probably about 10 or 11. For the very young, the witch is too scary as is the entire, cruel spirit world that Chihiro finds herself trapped in plus it’s just far too odd & the themes would be lost on the young. More than anything, they just wouldn’t appreciate this one until they were a little older so I think it’s probably best to wait before introducing them to this one. 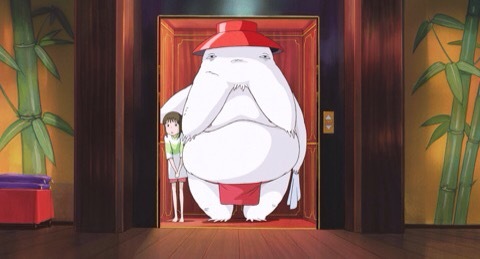 I’m really glad I re-watched this one again after watching more Studio Ghibli films. 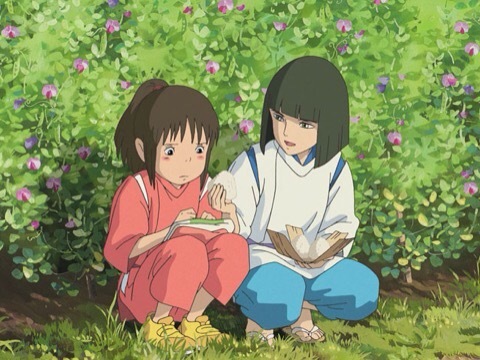 I wish I could love it in the same way others do and in the same way I love some of the other Ghibli films but I certainly appreciate Spirited Away and think it’s deserving of all the praise & recognition it has received. I’d certainly watch it once (or twice) again and know it’s one that would grow on me. Spirited Away should be seen by all film lovers but I’d recommend testing out a couple other Studio Ghibli films first before delving into this one if you’re new to them.